Even the fiercest are tamed. Ambage hac cupiens significare duces. 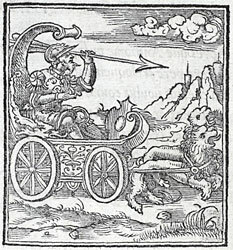 After Antony, that grievous bane of his country, had destroyed eloquence by slaying Cicero, he mounted his chariot in triumph and yoked to it lions, forcing their necks to bow to the harsh yoke, desiring by this symbolic act to indicate that great leaders had given way before his military might. Les grans, qui grosse audace avoient. 1. ‘had destroyed eloquence by slaying Cicero’. Cicero was considered Rome’s greatest orator - his name was held by many to be synonymous with eloquence itself; see Quintilian, Institutio oratoria 10.1.112. Mark Antony had Cicero murdered in 43 BC in revenge for his scathing attacks in the fourteen ‘Philippic’ orations. See Seneca the Elder, Suasoriae 6.17. 2. Cf. 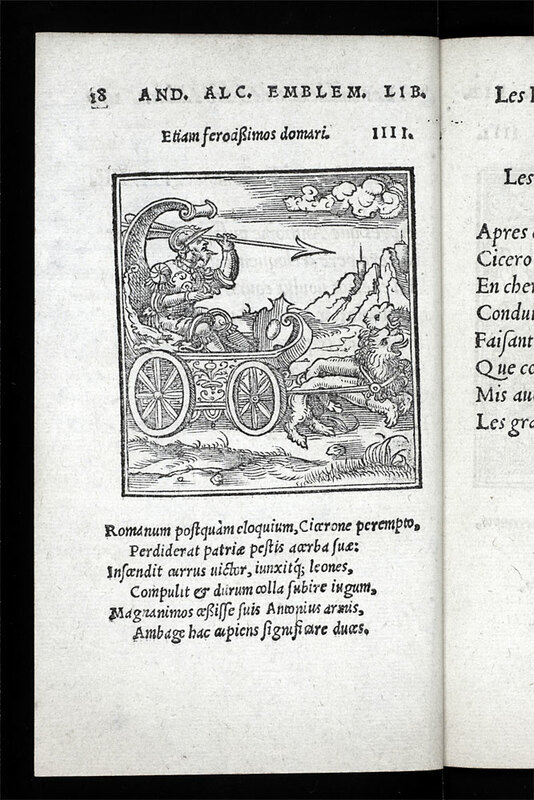 Pliny, Natural History 8.21.55: Antony was the first to yoke lions to a chariot in Rome...by this unnatural sight giving people to understand that noble spirits were at that time bowing to the yoke.